I was just watching a video from Mattan Griffel on the General Assembly website about growth hacking (scroll down about halfway). I was in a meeting the other day with a potential client here in Hong Kong, explaining to them the way we work, and a statement by Griffel in the video summed it up perfectly. Here’s the video screenshot. 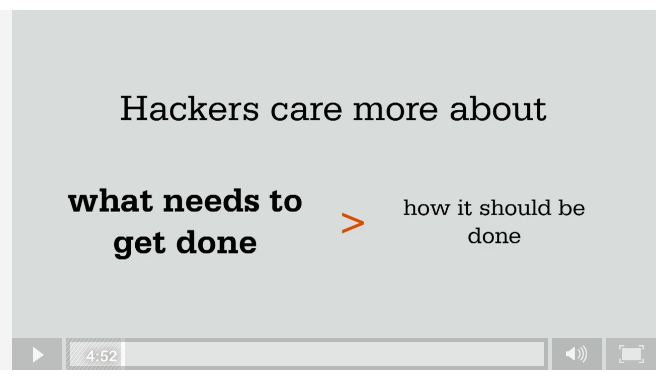 Hackers care more about what needs to get done than how it should be done. But first, what is a hacker? If you associate the term with someone who hacks into computer networks like Robert Redford in Sneakers and steals corporate information, yes, that is one type of hacker. But there is another, somewhat-related-but-less-criminal definition of the word “hacker” which is simply someone who figures out how to get things done, often using tools never intended for what the hacker has in mind. And so you have IKEA hackers, tech model railroad hackers, and mommy hackers. If you want to dig in to this type of hacking, allow me to recommend Paul Graham’s excellent book Hackers and Painters. For an SEO professional, hacking is the norm. If SEO clients understand this, they’ll understand better why their SEO firm wants them to sign up for a recurring monthly agreement, and why their SEO firm isn’t always 100% confident in saying exactly what the results of their work will be. SEO is hacking because of two factors; 1) technology, and 2) competitors. Technology. The technology behind search engines is always changing. In the past few years Google has released updates named Penguin, Panda, and Hummingbird. For clients who were already focused on the right SEO strategies and tactics, nothing much changed. But for a lot of SEO clients the world changed as they saw their rankings plummet. And there will be more changes to come. Competitors. Even if the technology were to stay the same, every time an SEO client’s competitor changes something with their SEO, it affects rankings on Google which can push the client’s website up or down. Where hacking comes in is that it’s the job of the SEO expert to figure out both what is changing with the technology, and the competitors, and craft the right strategy for his client. At a high level, the tactics are pretty much always to generate more high quality content and build more high quality links. But that’s a bit like saying the tactic in football is to make sure the ball always goes in the goal. Easier said than done. This is why an SEO client might get confused when rankings are down, but the SEO company he has hired is saying the client had a great month. If rankings are down but conversions (leads and sales) are up, that’s why it was a good month, in spite of the rankings being down. The main point I want to get across is that SEO experts don’t have all the answers. Every client is different, every website is different, and every day is different when it comes to SEO. Things are changing all the time, and there’s only one formula for SEO success–figuring things out. A client who expects to get concrete answers and accurate predictions is likely to be disappointed because that’s just not the way SEO works. SEO experts can make educated guesses and predictions based on experience, and perhaps even say “I think we can double or triple your leads in the next 12 months,” but it’s still just a guess, even if the SEO company a client is talking to has worked with similar clients 10 times before. Therefore when a client goes to hire an SEO company, he shouldn’t be looking for the best guarantee, but the best hackers. The people who can talk about how they were faced with a situation they had no idea how to overcome, but they figured it out. Those are the SEO experts who will be able to figure out the best strategy and tactics for their clients.